In memory of our beloved compadre and longtime Golf Event Jedi Master, Manny Otero, we introduce The Manny Otero Memorial Cup! Golf Teams will compete for this coveted trophy. Each player receives a goodie bag, commemorative golf apparel, complimentary range balls, 1 free raffle ticket (need not be present to win) and complimentary lunch & dinner (at post tournament awards dinner). 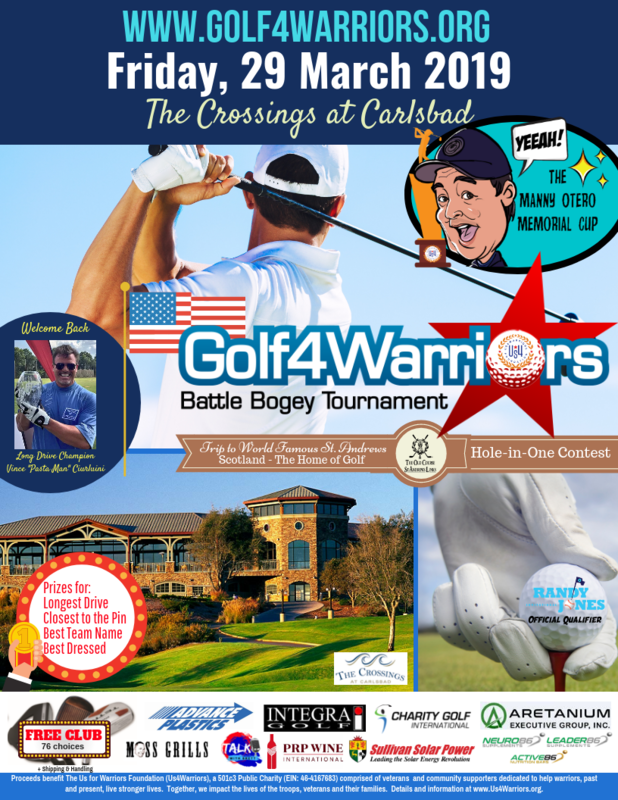 All proceeds from this event support Us for Warriors Foundation(Us4Warriors), a 501(c)3 tax exempt non-profit charity comprised of uncompensated veterans helping warriors live stronger lives. As the San Diego County Veterans Non-Profit of the Year of 2016, Us4Warriors strives to bring a fantastic day to all participants! Fundraising Opportunities: Fund raised in support of the Us4Warriors programs supporting warriors, past and present, to live stronger lives. Raffles, Auction, Long Drive event, Contests and more!